MH370 – New Phase Detected Pings – footsteps…….. 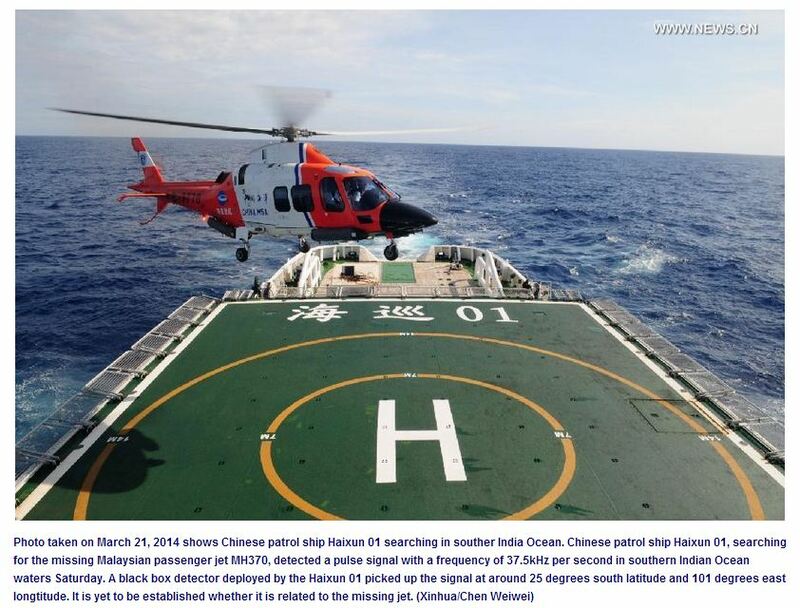 It was reported today by Xinhua News that a Chinese SAR vessel Haixun 01, detected pulse signal of 37.5 kHz frequency at the search location for the missing MH370 aircraft in the South Indian Ocean. The frequency is a standard signal from black boxes or specifically cockpit voice and flight data recorder. Anish Patel, President of Dukane Seacom told CNN that its the same frequency. The patrol vessel arrived at the new search area north of the 1.15 million square-kilometer patch of the earlier designated search area on Friday. However it needed to be verified by the SAR Coordination Centre in Perth. Search and Rescue entered its new phase by moving underwater since Friday with the deployment of a towed pinger locater. Two ships with locator capabilities are searching a 240km (150 mile) path in a bid to retrieve the data recorder.